Last month, Oracle launched a new webinar series on Leading Practices of Application Management. We are following up the initial set of events with new subjects for December. The first three are new subjects, while the last two are re-runs that are scheduled at times more suitable to the APAC audience. One of the challenges that we face when scheduling these webinars is the global nature of Oracle's customer base. There is no single time that works. In fact, we have to come up with three time slots - 11 a.m. Pacific for the Americas, 3 p.m. GMT for EMEA, which covers everything from U.K. to Turkey, and 5 a.m. GMT, which should be a suitable time for everyone from India to Australia. From my previous post, you probably get the idea that I view ITIL favorably. It is a comprehensive framework that provides a lot of good advice, and it provides a common language for IT practitioners. While it is useful, learning about ITIL can be a challenge by itself, as it is like learning another language even though the language may already be somewhat familiar. Last year, we conducted a survey at OpenWorld, which asked several questions about practices on service level management and change management. Many people checked the box indicating that they had some sort of processes in place. Yet, when we asked whether people were implementing ITIL, the same people who checked those boxes stated that they were not implementing ITIL. That was rather strange as service level management and change management were two of ITIL processes, so either people did not know what ITIL stood for, or did not think their process implementation was up to the standard that ITIL defined. We think the former reason was more probable. Service Strategy - focuses on the identification of market opportunities for which services could be developed in order to meet a requirement on the part of internal or external customers. The output is a strategy for the design, implementation, maintenance and continual improvement of the service as an organizational capability and a strategic asset. Key areas of this volume are Service Portfolio Management and Financial Management. Service Design - focuses on the activities that take place in order to develop the strategy into a design document which addresses all aspects of the proposed service, as well as the processes intended to support it. Key areas of this volume are Availability Management, Capacity Management, Continuity Management and Security Management. Service Transition - focuses on the implementation of the output of the service design activities and the creation of a production service or modification of an existing service. There is an area of overlap between Service Transition and Service Operation. Key areas of this volume are Change Management, Release Management, Configuration Management and Service Knowledge Management. Continual Service Improvement - focuses on the ability to deliver continual improvement to the quality of the services that the IT organization delivers to the business. Key areas of this volume are Service Reporting, Service Measurement and Service Level Management. If you are familiar with ITIL v2, you probably recognizes that many of these processes are similar to those in v2. I think one way to look at v3 is that it is an improved and superset of of v2. For more details on these processes, you need to get the official books from Office of Government and Commerce, the United Kingdom agency who serves as the official publisher of this methodology. In an earlier post, I made a point that people, process, and technology are all pre-requisites for achieving success in enterprise application projects. I am going to focus today's post on processes, specifically process frameworks around application lifecycle management. You probably notice that Oracle alone has several methodologies, so there is no shortage of process to follow. By the way, in case you are wondering, the various Oracle methodologies eventually are supposed to get merged into the Oracle Unified Method. That can be a subject of a whole different discussion. I am not sure if there is such a thing as the perfect methodology. 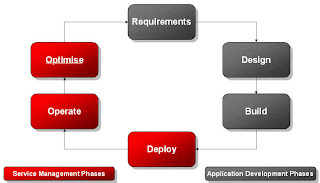 Some of these methodologies are more development focused, while others are more operations focused, but I think there is increasing realization that an application project's complete lifecycle starts from the moment when the project is kicked off and ends when the application is retired, so a comprehensive application lifecycle management process framework needs to address both development as well as operational needs. Infrastructure Management, Security Management, Asset Management and Application Management were in separate books. Except for the Application Management book, which depicted an application management lifecycle, ITIL v2 did not point out explicitly that many of the Service Management processes really need to start before the application goes into production. In fact, in the Application Management book, it separated the pre-production activities in the first three phases as Application Development activities, while the activities in last three phases were classified as Service Management activities. That to me was a bit weird as it implied that the work to come up with a service level agreement do not take place until the application is ready to go into production. In reality, many of the considerations for defining service level goals should be done as part of overall planning in an application project. These five phases cover everything from initial planning to on-going postmortem analysis needed to drive continual improvements. To me, this makes a lot more sense. If someone needs to manage capacity, or ensure availability of the application, which traditionally are seen as more of operational activities, the planning aspects of these really need to be carried out by the operations team up front as the functionalities of the application are getting implemented in parallel by the developers. Even something as “operations centric” as monitoring has a pre-production component – one needs to plan what needs to be monitored and instrument the application accordingly. As the ITIL v3 evolution illustrates, a comprehensive framework that provides holistic recommendation to application lifecycle management best practices needs to cover all phases of the lifecycle and addresses both development and operational activities. As an added bonus, ITIL also provides a common vendor-neutral language to talk about various issues. Many terminologies are so overloaded, especially with vendors (Oracle included) all using them to suit their needs, that it can be difficult to talk about many issues without re-defining the terminologies at the beginning of the discussions first. ITIL pretty much eliminates this confusion. Therefore, I am going to make reference to it in my future blog posts. Oracle is launching a new webinar series on application management. We have seen that oftentimes, technology is not the only source of challenges for customers. To achieve targeted application service level cost effectively, one needs to consider organizational and process issues holistically also. In this weekly webinar series, we plan to talk about not only the technologies for managing applications, but more importantly, the leading practices and how various tools can be used to facilitate the implementation of practices. In November, we plan to present overviews of our application management packs, the centerpiece of our management tools for packaged applications. After that, we will begin our deep dive into specific topics for each application domain. See the bottom of this post for some example topics. You may click here to get the summarized list of upcoming webinars, and here to get a more detailed description for each event. These webinars will be recorded and made available for on demand playback. For schedule and registration options visit webcasts page on OTN. Last week, I went to Europe to present our application management products at a field training event. To start off the presentation, I wanted to make an attention grabbing point in order to set the stage for the rest of the discussion, so I cited cases of enterprise application projects that failed spectacularly. If you wonder what those projects were, let's just say they involved software made by a German company, as well as software made by a U.S. company. I tried to maintain balance in my critique. In everyone of those cases, the project failed not only because of the software involved, but also the organizations and their project management. Common problems were ill defined requirements, lack of testing (functional and load), unrealistic time lines, undersized capacity, lack of operational management discipline, lack of training (developers, administrators, end users) and last but not least, software technical problems (they were software implementation projects after all). The very annoying thing is that these enterprise application project failures were not isolated incidents. They still keep on happening. In my own opinion, a key part of the problem is that while many organizations aspire to achieve the benefits that enterprise applications provide, they underestimate the amount of “homework” that they need to do to realize those benefits. Technology is only one of the components to consider in the homework assignments. The people and process aspects are equally, if not more important. Together, people, process, and technology form the basis of achieving success in enterprise application projects and they must be managed properly. and last but not least, the proper governance. Almost everyone of these factors involve getting the right people to do the right thing at the right time using the right tool, and many of these factors are important whether one uses SaaS, hosts the application with an application hosting provider, or runs the application in-house. These are all homework that organizations need to work on if they want to realize the full benefits of deploying enterprise applications. Oftentimes, these homework do not get done, or they do not get done properly. One reason I believe organizations don't do the proper homework is that they underestimate the complexity of enterprise applications. A friend of mine, who happens to work for an aerospace firm designing rockets, once commented to me that he couldn't figure out why companies have such a hard time implementing business applications. Running an application to store and retrieve some data from the database didn't seem like rocket science to him. Implementing application is definitely not rocket science. After all, an application is not a rocket, so the science involved should be “application science” instead of rocket science. Even though implementing an application is not rocket science, it doesn't mean it is easy. Getting a cruise missile to hit a target hundreds of miles away is hard, but so is maintaining sub-second response time for 10,000 concurrent call center users, or thousands of students who all try register for classes last minute, or thousands of users on an eCommerce website all trying to buy the on sale item at the peak of the Christmas shopping season. Complexities in enterprise applications exist because of the complexities of the problems that they try to solve. While many vendors, Oracle certainty included, are on a quest to simplify the applications, let's just say it will still be more complex to implement enterprise applications than installing a Nintendo Wii at home for the foreseeable future. By the way, the complexities and the associated “homework requirement” is not that different from other complex systems. Even something as commonplace as the automobile requires regular maintenance – oil change, tune up, proper tire pressure, etc... – to run smoothly and maintain good gas mileage. Implementing applications without doing the proper homework is like running a car without maintenance. Sooner or later, the application would stop working just like a car would stop working. It's almost noon as I get to this part of the blog, so I think I am going to head out to grab something to eat. Let me resume this discussion on people, process and technology on my next blog entry. OpenWorld is over!!! As much as I enjoyed the event, I felt a sense of relieve when I stepped out of my last meeting at the Customer Visit Center at Moscone North on Thursday afternoon. One of my colleagues saw me and commented that I looked “dead serious”. I told him to leave out the “serious” part. I was just “dead”, after being sleep deprived for the whole week. I slept on my bus ride back to headquarters. Friday was a regular workday (no vacation!). There was a product review meeting for the next release of Enterprise Manager, a planning conference call for field events, a brief chat with my boss, conversation with my team on the to-do list for this quarter, and reviewing of the notes that I took at the event and following up with a long list of people I met to keep me quite busy. Speaking of notes, I took plenty of it from the interesting conversations at the event. Here is a sample. Help us standardize – One of the pain points that I heard from customers was that operating silos have made it difficult to manage their applications. Different teams use different tools, which don't work well with each other. Different teams developed different practices, which in some cases conflicted with each other. Common tools, and common best practice recommendations from Oracle are highly desirable. Help us manage changes – I heard this over and over throughout the week whether it was discussion on Sunday's OAUG Change Management SIG, conversations at Demoground, or on Thursday's application management roundtable. Change is hard even with tools such as iSetup and ADM, as they do not yet cover the complete change workflow. Another dimension in change management is access control, as different members of the team different authorizations for changing the different parts of the applications, and our software needs to be smart enough to enforce the separations. Help us figure out the proper way to use your software – One particular example was whether people should set up a single Enterprise Manager Grid Control environment or multiple environments. Our default recommendation is single instance, but there are technical as well as organizational factors that might make it better to have multiple instances. I will write about this more in a future article. Speaking of organizational factors, I believe that it takes more than just software to solve many of the problems that were discussed throughout the week. Ultimately, it takes a combination of people, process and technology to get things done. People refer to all of us working at Oracle, at partner companies and at customer organizations to overcome the various application management challenges, and we need to keep on talking amongst ourselves to exchange ideas. Do the issues above sound familiar? Summit your comments either on my blog or on discussion forums. If you are an architect or senior IT manager and wish to talk about more strategic or policy issues, here are the groups for you. 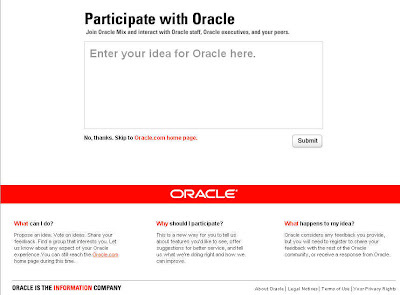 When I logged onto Oracle.com this morning, I was greeted by this page. This is Oracle Mix, a new Oracle platform for connecting with the Oracle community, network, share ideas, and get answers. I think this is a cool idea. As a product manager, one of the most important things that I have to do is to gain insights on our customers' needs. However, unlike my peers who are on the consumer side of the technology business, especially those that manage web-based products, it is a lot more difficult to conduct broad base customer research. Traditional mechanisms such as customer advisory boards, while important, can be rather slow. Oracle Mix could be a great additional tool for understanding our customer needs if it is used properly. 1. Participate. This tool is not going to work unless we all use it. 2. Give meaningful titles, use the proper tags, and associate with the right product when asking questions and making suggestions. This helps channeling your postings to the right people. 3. When proposing improvements, state the underlying problems that you need to solve. #3 is especially important. We sometimes get enhancement requests that basically tell us to "add a knob" here or "take out something" there. While the requests may sound very specific, it could actually very hard to use the information. Different customers tend to have different ideas of solving the same problem. While it is good to hear the specific recommendations, following them blindly could lead to piecemeal product changes that undermines the integrity of the product. Therefore, it is much better to find out the underlying problems so that we can learn about the rationale behind the requests and come up with solution that address problem root causes. Click here to access Oracle Mix. Lots of news are coming out of Oracle on the application lifecycle management front. In addition to announcing the ClearApp acquisition on 9/2 and Oracle IT Service Management Suite's PinkVERIFY certification on 9/9, Oracle also announced the availability of Oracle Application Testing Suite (ATS). With ATS, Oracle now provide tools that cover the complete application lifecycle, from development to test to production management. Oracle Application Testing Suite is the first release of the product since it was acquired from Empirix earlier this year. Amongst many improvements is an open and integrated scripting platform for both load and functional testing. This is one of the product's key strengths, as some other competing products require users to set up separate scripts for functional and load tests, creating un-necessary rework. In a way, ATS is not a completely new product to Oracle customers. Empirix was one of Siebel's test automation tool partners, and released one of the first tools designed specifically for managing Siebel. The latest ATS release continues this effort by providing functional and load test accelerators for Siebel. Along with Application Management Pack for Siebel, ATS is part of Oracle's complete solution for managing Siebel application lifecycle. More information about ATS can be found here. You may download a trial copy of ATS from Oracle Technology Network. At ItSMF Fusion 2008 conference, Oracle announced that its IT Service Management Suite has been certified as ITIL compatible through Pink Elephant's PinkVERIFY IT Service Management certification program. The certification is achieved for six core ITIL processes: Incident, Problem, Change, Configuration, Release and Service Level Management. Oracle's IT Service Management Suite is made up of Oracle Enterprise Manager, Siebel Helpdesk and Oracle Business Intelligence Enterprise Edition. The call to adopt more vigorous business disciplines in running IT has become louder and louder each year, and the trend can be seen in the increasing adoption of ITIL practices. In a way, running IT in a business manner and making IT decisions according to business needs should really be a no brainer. Conceptually, IT management shares many common problems with other management domains, from project management to finance to operations. Indeed, we have seen customers applying many Oracle technologies that they use to run various business functions to manage IT. Standardizing on the same technologies helps simplifying the IT environment, leading to better economy of scale and cost savings. Furthermore, it is easier to integrate IT management processes with core business processes when the same software is used. More information about Oracle's IT Service Management Suite can be found here. Following the acquisitions of Moniforce, Auptuma and Empirix eTest Suite product line, Oracle announced today the acquisition of ClearApp, a supplier of application management software for composite applications. This acquisition, focusing on SOA application management, complement Oracle Enterprise Manager in creating a comprehensive application management solution to help Oracle customers achieve enhanced service levels, reduced system down-time and improved return on SOA investments. More information about this latest acquisition can be found at www.oracle.com/ClearApp. Windows x64, Linux x64 and Linux Itanium based Enterprise Manager Grid Control 10gR4 agents are now available. To get them, download the Mass Agent Deployment package from OTN. Application Management Pack for Siebel’s eStudy is now available. The self pace online course is a tutorial for deploying, configuring and using our Siebel pack. The course assumes familiarity of base EM capabilities taught in the 5 days instructor led Enterprise Manager Grid Control training course, and complements other training that covers EM features such as Service Level Management and Configuration Management in greater depth. You may access this training at the following URL. What can do I with this SARM data? I woke up this morning finding a message in my inbox coming from an ITtoolbox subscriber asking about SARM. Wow, I thought, someone is trying to use my baby. So I replied the message over breakfast. The information may be interesting to others who want to know more about SARM, so I am re-posting it here. I was the original product manager for SARM. Let me provide some explainations. Back in Siebel 6, it was easy to figure out performance problems, as Siebel client ran as a Win32 program on PC, and connected directly to the database. Each user connect via a separate database session, and all the business logic ran on the client PC. Things got a bit more complicated with Siebel 7. With the web based interface, Siebel 7 enables organizations to be more agile, as they could revise their application more easily to reflect changing business processes without pushing the software out to thousands of users. However, the architecture also placed more demand on the mid-tier servers. In addition, a single transaction request (query, save, navigation, etc...) requiring going from web browser to web server, from web server to Siebel App Server, and from Siebel App Server to database server. Connection to database could be shared via database connection pooling. Tracing transaction from the user to the database in order to identify performance bottleneck root cause became very difficult, as it was very difficult to tell which user initiated what database request, and there was no way to figure out what the mid-tier was doing. In Siebel's own IT department, everytime a performance problem occured, the IT staff would summon a couple engineers from our product development organization to figure out the problem. This was very expensive in engineering productivity, and most customers did not have this option. In Siebel 7.5, I asked our IT operations director what we could give his staff to make life easier. The answer was a way to see what goes on inside the Siebel app server environment. SARM was born as a result. SARM is made up of three parts. The first is the instrumentation framework. The second is the collection of instrumentation. The third is the tool for analyzing the data. SARM instrumentations are strategically placed in various parts of the Siebel software stack. When a transaction request enters the Siebel server layer, the first timer goes off. As the request makes it way down the stack (think of it as a call graph), additional timers go off. These instrumentation points capture timing information, CPU/memory utilization, and contextual information about that instrumentation point. Data for each instrumentation point makes up a single SARM entry. Each SARM entry includes the identification of the instrumentation point (AreaDesc). For example, the workflow engine would be one of those instrumentation points. For workflow, the application string field also stores the name of the workflow, so that you can tell not only the workflow engine is invoked, but also the particular workflow that is being run, and the amount of time spent running that workflow. User id, business component name, view name, applet names are also stored in the entries of the respective areas. Let's say you have a transaction request that ran for 15 seconds. You want to find out the breakdown of the time spent. Using the area description and the text string, you can find out how much time is spent at each Siebel layer, and find out the exact workflow, business service or script that is causing the problem. You would know who initiated the transaction request since the user id is recorded, and which part of the application (view and applet name) the request came from. It took a couple releases to get SARM fully done. 7.5 was the first release. Naturally, with any version 1.0 technology, there were some short comings, and there were not too many instrumentation points to capture data. In 7.7, the technology became much more mature, with better optimization to minimize overhead, and more instumentation coverage after we took a companywide effort to ask every single development team to instrument their code with SARM. 7.8 was an application functional release so SARM in 7.7 pretty much was the same in 7.7. We made further improvements in 8.0 to give administrators more ways to fine tune SARM data collection. In addition, one thing that had been missing in SARM was a good graphical tool to analyze all the rich information. The command line tool, which was intended to convert the binary SARM data to CSV so that people could import it into spreadsheet, just didn't cut it. The reason why we didn't come up with a graphical tool initially was resource constraint. We needed to focus our energy on making sure we could collect good SARM data first and did it in an efficient way. Otherwise, the best analytical tool in the world wouldn't help. The lack of good graphical tool also changed in the Siebel 8 timeframe. One thing that is cool about being part of Oracle is that Oracle has a lot more people. We actually have a whole division of people focusing on building management tools. So after we became part of Oracle, we shipped a graphical tool (Siebel Diagnostic Tool) as part of Application Management Pack for Siebel. In fact, we have done more to the management tooling of Siebel in the past year than the 10+ years when Siebel was an independent company. The tool is now fully integrated with Application Management Pack for Siebel, which runs as part of Oracle Enterprise Manager 10gR4. Oracle OpenWorld 2008 is now open for registration. This year's event will be taking place quite a bit earlier from September 21-25 at the Moscone Center in San Francisco. We have already started planning the breakout sessions. If there is any particular topic on Oracle Enterprise Manager and application management that you want us to cover, leave us a comment. See you in San Francisco in September! You need to start using this version of the tool if you are still on the older (v1.x) release, as 1.x versions are already de-supported. For more information on the Maintenance Wizard, review note 215527.1 (login required). For information on training for the Maintenance Wizard, review note 418301.1 (login required). Collaborate 2008 is over. Presenting at Collaborate was a different experience from presenting at OpenWorld. OpenWorld was an Oracle's show, so I had to worry about a bunch of logistics of putting things together. On the other hand, Collaborate was run by our customers. I just had to show up, present, attend a couple sessions myself, party, and speak with people, which I seemed to have more time to do at this event. In one of the conversations, a question came up on the difference between application management and traditional systems management. I thought this may be an interesting topic for readers of this blog, so I am going to share that discussion with you. Gartner Group defines application management as the monitoring, diagnostic, tuning, administration and configuration of packaged and custom applications. This seems to make sense. Application Management is about the management of, well, applications. But what is an application, and how does the management of an application different from managing other IT components? An application helps end users accomplish a specific task. Siebel CRM, PeopleSoft Enterprise, Oracle E-Business Suite, Oracle Collaboration Suite, and the custom Jave EE-based software that you write, are all examples of applications, since end users can use these tools directly to perform to day to day work. Oracle RDBMS and Oracle Applications Server are not applications since end users typically do not write SQL statements, or Java code on run on these infrastructure software. Therefore, application management must be about managing these end user visible software, right? Yes, but not so simple. Consider this. The performance and availability of a modern distributed application, whether it is written in Java EE, .NET, or integrated application stacks such as those provided by Siebel, PeopleSoft and JD Edwards EnterpriseOne are determined not only by the application layer, but also the middleware, database, operating systems, network, and storage layers. Successful management of applications therefore call for a holistic approach of managing the entire environment that supports the application. In addition, because applications are used by end users in support of business activities, it is very important to manage applications according to business requirements and potential impact to business operations. This means defining performance and availability requirement according to the particular tasks that end users perform. In other words, application management needs to be done from the top-down, from the top where the end users are down to the bottom of the technology stack. This is rather different from the traditional systems management, in which the approach was much more bottom-up, and the focus is much more on the health of the individual components. It also means a whole new set of information to track, such as the activities that users perform on the applications and the experience that they get out of the applications. Linux x86-64 and HP/UX Itanium ports of EM Grid Control 10gR4 is out. You may download it from OTN or ARU. The first update to Application Management Pack for Oracle E-Business Suite is now available for HP/UX PA-RISC as well as Itanium in addition to the other O/S platforms that the pack support. You need Enterprise Manager Grid Control 10gR3 (10.2.0.3) to run this pack, and you may download it through Metalink as patch 5489352. The pack extends Enterprise Manager Grid Control to manage Oracle E-Business Suite systems. It supports E-Business Suite R11i (requires 11.5.10 ATG RUP4) and R12. Key capabilities include service level management, application performance management, configuration management, and automation of cloning processes. I will be covering this pack in my breakout session at Collaborate next week and at the Enterprise Manager demo booth at the Oracle demoground. Drop by if you are at the conference. See you in Denver! Oracle just announced the availability of six new system monitoring plug-in's to extend Oracle Enterprise Manager Grid Control's ability to monitor third party applications and technologies. These plug-in's support two commonly used applications - Microsoft Exchange and SAP R/3. They also cover infrastructure technologies such as EMC CLARiiON, VMware ESX, Apache Tomcat, and Sybase Adaptive Server. You may notice that many of these are products that compete against Oracle products. What's even more interesting is that five of these six plug-in's were developed by Oracle. You may ask, why would Oracle want to invest resource managing other company's products? The reason is simple. These are all technologies used in conjunction with Oracle products. In order for Oracle Enterprise Manager to provide a holistic view on the health of Oracle products, it needs to cover the adjacent technologies that are integrated with Oracle products as well. Unlike another infrastructure software vendor whose heterogeneous management strategy is to rely primarily on partners to do the work, Oracle has taken a much more hands on approach by investing its own resource. Collaborate 2008 is coming to Denver, Colorado in just over two weeks. For those of you who haven't attended the event, Collaborate is the combined annual conference of the three major independent Oracle user groups –IOUG (International Oracle User Group), OAUG (Oracle Application User Group), and Quest (PeopleSoft User Group). Contrary to what an IT trade magazine journalist recently reported, the Oracle community is alive and well. The early word is that the user group expects over 7,000 people attending the event. That's a double digit increase in attendence compared to last year, and quite a feat to pull off in this economy. Oracle will be a guest at the event, and we have numerous sessions planned around manageability of various Oracle applications and technologies. Here is a preview. With the exception of the last session “Step to Fusion”, all the sessions are listed under the IOUG conference agenda. “Step to Fusion” is listed under the OAUG agenda. The “Step to Fusion” session is targeted for people who run Siebel, PeopleSoft Enterprise and Oracle E-Business Suite applications. We will cover how you can use Oracle Enterprise Manager to manage these applications today, and discuss the roadmap for evolving your application management toolset to facilitate your eventual adoption of Fusion technologies.